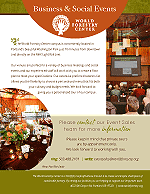 Thank you for choosing the World Forestry Center (WFC) for your event. While we want you to have a successful event, you and everyone attending your event will be expected to follow these rules and the requests of our staff. Rental Fees Exceeding $750: Upon signing, one-third of the Rental Fee is due to WFC. You must pay the remainder of the Rental Fee no later than 30 days before your event date. Rental Fees Not Exceeding $750. : If the Rental Fee is $750 or less, then the entire Rental Fee is due to WFC upon signing. Security Deposit: The Security Deposit is to be paid no later than 30 days before the event date. Payment Failure: WFC may terminate your contract or decline to rent the premises to you if you fail to pay the Rental Fee or Security Deposit. You are required to use one of the caterers on our preferred list for your food and beverage needs. 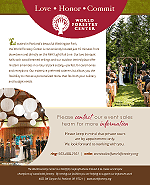 WFC does not have on-site catering; however, we have established good relationships with many competent caterers in the area who are familiar with our facilities, rules, recycling, and cleanup requirements. These caterers can also help with linens, decorations, and other equipment. You will contract for your food and beverage needs directly with the catering company. WFC is not responsible for the caterer’s services or performance under your contract. Confirm with your caterer that they will clean the building at the end of your event. WFC will provide and set up tables and indoor chairs according to the floor plan determined by you and your caterer and submitted no fewer than seven days before the event. Minimal changes may be made at WFC discretion if the final floor plan violates local fire codes by inappropriately impeding access to exits or emergency equipment. For events located in Miller Hall or Cheatham Hall, WFC may provide basic audio and visual equipment at your request. We will not, however, provide on-site Audio or Visual Technicians for the event. WFC does not provide linens, silverware or tableware, outdoor chairs, copier services, fax machines, or office services. Additional last minute or day-of event changes to the floor plan, including adding equipment, may be subject to a fee. Cancellation by client: If you cancel your event more than 30 days before the event date and the rental fee exceeds $750, then WFC will retain as a cancellation fee one-third of the Rental Fee. If you cancel your event more than 30 days before the event date and the rental fee is less than or equal to $750, then WFC will retain as a cancellation fee the full rental fee. If the event is canceled 30 days or fewer before the event date, then the full rental fee will be retained by WFC. The security deposit will be refunded to you if you cancel your event at any time before the event date. Cancellation by WFC: Our staff may cancel the Event if we determine that providing the premises as originally anticipated on the effective date may jeopardize the safety of those attending the event or otherwise on the premises. You may reschedule your event at a mutually-agreed date and time. If you and WFC cannot agree to a rescheduled date and time, then WFC will return the Security Deposit and paid portion of the Rental Fee to you. Our campus includes multiple buildings. Please indicate on your invitations the building in which your event is to be held (e.g., World Forestry Center Miller Hall). A-frame sandwich boards are available for your use. We encourage you to make at least two vertical weatherproof signs that are 24”x 36” directing people to your function. These signs may be taped to the sandwich boards. Do not tape any signs over WFC’s Private Event signs. General Liability Insurance: Client agrees to provide general liability insurance in an amount no less than $1,000,000, for each occurrence, covering the Event and naming World Forestry Center and the City of Portland Parks and Recreation Bureau as additional insured. The certificate holder should read as follows: World Forestry Center and City of Portland Parks and Recreation Bureau, 4033 SW Canyon Road, Portland, Oregon 97221. Liquor Liability Insurance: If client is charging guests for alcohol (this includes both paying for individual drinks AND/OR paying a fee to get into the event), the client needs to provide LIQUOR LIABILTY INSURANCE in an amount no less than $1,000,000 covering the Event and naming World Forestry Center and the City of Portland as additional insured. Host Liquor Liability Insurance: If client is not charging for liquor, or there is not an entrance fee into the event, client needs to provide HOST LIQUOR LIABILTY INSURANCE in an amount no less than $1,000,000 covering the Event and naming World Forestry Center and the City of Portland as additional insured. Automobile Insurance: In an amount no less than $1,000,000 covering the Event and naming World Forestry Center and the City of Portland as additional insured. Encourage people coming to your event to take advantage of the MAX Light Rail station that comes right to our campus. The MAX park-and-ride lots are generally available evenings and weekends. For more information call TRI-MET at 503-238-RIDE or visit their website at www.trimet.org. •	Contact the Oregon Zoo (503-226-1561) and the Portland Children’s Museum (503-223-6500) to see if they are planning special events that might conflict with your event. •	A few parking spaces are available behind your event building. You may use these during your event for caterers and others. Building access time is determined on an individual basis and is listed on your contract. Ending time for all events is no later than midnight. End times differ for the Mount Hood Room and Discovery Museum rentals. All changes to the event date, access time, start time, end time, or event scope must be approved in advance by WFC in writing. Changes requested less than 30 days before the event date may result in additional Rental Fees. If rose petals are used outdoors, they must be cleaned up by the end of the event. No rose petals are to be used indoors. No decorations may obscure fire beacons, emergency signage or pathways, lighting, or EXIT signs. Amplified music is not allowed on the Central Plaza, or anywhere else outside on the WFC campus, after 10pm. All deliveries are to be made between the access time and end time for your event. You must be present to sign for all deliveries. WFC employees will not sign for any client deliveries. •	Noises or vibrations that ‎disturb others on or near the property. Neither smoking nor the use of tobacco or cannabis is permitted at any WFC facility. No portion of any passageway or exit door may be blocked or obstructed in any manner and no exit door shall be blocked, hidden, or bolted from the inside while WFC's facilities are in use. WFC may, as a condition to conducting the Event on the Premises, require Client to provide professional security personnel. WFC will not be responsible for items that are lost, stolen, or abandoned. After your event, WFC staff will inspect the premises and surrounding grounds. If the Premises and surrounding grounds have been returned in a neat, clean, and undamaged condition, then WFC will refund your Security Deposit within 30 days. If the premises or any surrounding grounds have been damaged or have not been restored to a neat and clean condition, then WFC will notify you and deduct the Security Deposit by the cost of restoring the Premises or surrounding grounds. In the event of excessive damage, you may be charged additional fees for repairs. We are happy to answer any questions you may have, but encourage you to first view our FAQ’s as they provide quite of bit information.